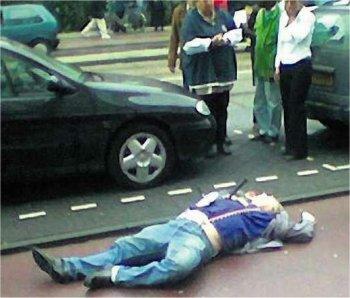 One might hope to read some intelligent reporting about the assassination of Theo van Gogh on an Amsterdam street by a local jihadist on the anniversary of the event. Instead, the inevitable comparisons with the earlier Pim Fortuyn murder showed disturbing ignorance about Europe's clash of civilizations. AP wrongly stated that killer's "motives were unrelated to anything Islamic." In fact, leftist Volkert van der Graaf "told judges he acted on behalf of the country's Muslims" when he shot the Parliamentary candidate in the back. Furthermore, Francis Fukayama accused Fortuyn of "valuelessness" despite Pim's staunch defense of individual rights in the face of violent Islamic totalitarianism. The back story on the victim remembered today is this: Theo van Gogh was a provocative filmmaker whose short film "Submission" about the normal cruelty experienced by Muslim women outraged Islamic men. (Van Gogh's collaborator on the film, member of Parliament Ayaan Hirsi Ali, has lived with armed guards and in secret locations ever since.) The killer Mohammed Bouyeri said at his conviction that he would gladly headchop anyone who disrespected Islam. Five hundred gathered in Amsterdam to remember the murder of van Gogh. Politicians bemoaned the social division the killing had exacerbated, as if Dutch citizens should ignore the growing danger of the fifth column caused by unwise immigration. A recent survey showed that a "big majority" of Dutch in the largest cities view relations with Muslims as negative. More ominous is that free speech has been chilled as critics of Islam have increasingly received bullets in envelopes. As Josef Stalin observed, the murder of millions is a statistic while the murder of one person is a tragedy. In the same way, the brutal jihadist killing of an individual artist riding a bicycle on the streets of Amsterdam shocked Europeans as little else could. In the last year, multiculturalism has been on the ropes in Europe, even condemned as a failure by the elites who had once promoted it. To its credit, the Netherlands has toughened up on its cultural expectations, particularly with Immigration Minister Rita Verdonk's recent recommendation that the burqa be banned, a proposal that strikes into the heart of Islamic oppression. Closer to home, George Bush has finally named totalitarian Islam as the enemy. Can Washington learn enough from Europe's mistakes to at least end immigration from nations that support terrorists? Someone could remind him there's no right to immigrate.